The farm is located approximately on Km. 3 along the Mae Rim-Samoeng route. 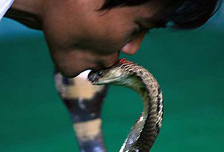 It is home to various kinds of snakes native to Thailand. The farm, which also conducts snake breeding, provides 30-minute snake shows daily. For more information, contact tel. 0 5386 0719.